AFTER his 1929 Plymouth was stolen in the '80s, Paul Smith and the police tracked the car as it took off around the country. Despite their efforts, the thieves were cunning and the vintage car slipped away. Thirty years later, Mr Smith tried again and bought another vintage vehicle. This one was heavier and much harder to manhandle. "I was looking for an old car to do up and I had one offered but it fell through,” he said. Mr Smith's friend, who was helping him find a project car, discovered another vehicle, which didn't fit the description. He called Mr Smith anyway. "He said 'you better go and look at it first' and I went down and looked at it and gave him the money straight away,” he said. 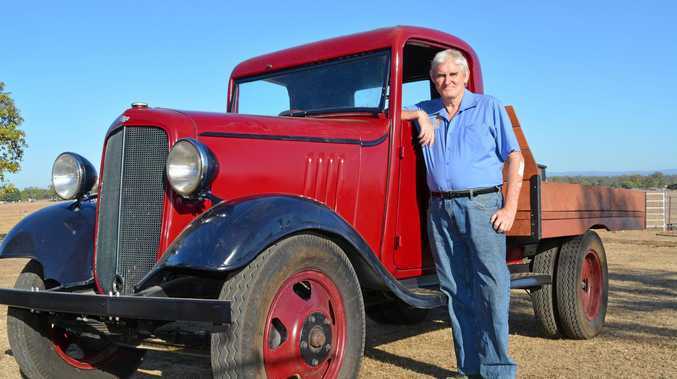 Six years on, Mr Smith has nearly restored the vehicle - a 1934 Series PB 1.5 tonne Chevrolet truck with a 131 inch wheel base. When he first saw it, he could see it was "99.9 per cent there”. "Like all old cars left sitting, I could see there was a lot of work to be done but I could also see the potential for what it was,” he said. Following a full nut and bolt restoration back to bare chassis, the truck was able to be driven for the first time in years. "I took it for a drive for the first time this morning,” Mr Smith told the Gatton Star on March 12. "It drove a hell of a lot better than what I thought it would, mainly because there was no such thing as power steering or anything like that and it has mechanical breaks. Having purchased the vehicle in October 2012, the maiden voyage was a long time coming. "It wasn't a simple 'just do it' quick prank work, it was go back, straighten out the chassis and make sure everything was correct,” he said. Together with his friend Chris, Mr Smith spent more than five years working on the car, five minutes from Hatton Vale. "My mate gave me a hand. He's been invaluable,” he said. Though it has come a long way, there are still miner details to be addressed before the car can be deemed roadworthy in Queensland.